One of the most annoying aspects I found with my toolbar buttons was not being able to move them. I found the lack of movability quite disturbing. I knew there had to be a way, but where to start? 1) Make an empty folder somewhere it will not be disturbed. I kept mine in My Documents next to my Stacks folder. 2) Make sure your toolbar is unlocked, right-click Toolbars and then New Toolbar. Select your empty folder and continue. 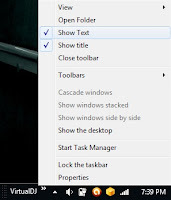 3) Right-click on your new toolbar icon and uncheck Show Text and Show Title. This makes the toolbar icon invisible. 4) Now just move the icon around as you want, adding other icons and/or stacks to the right of the invisible toolbar icon. 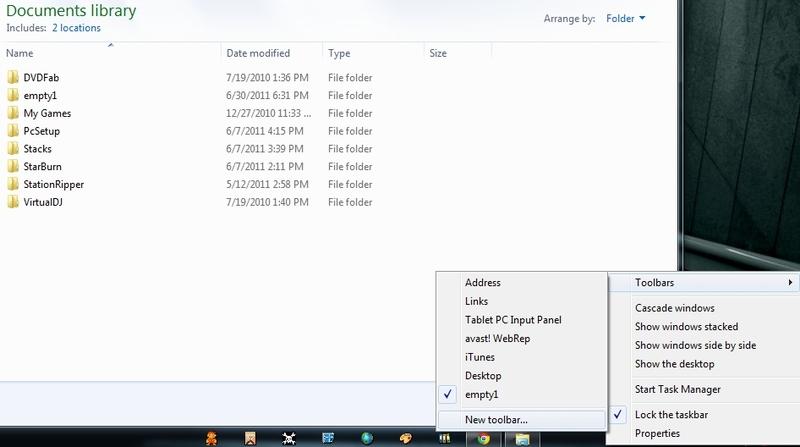 You can use this method of moving your icons to the center, or wherever along the toolbar. Some folks like to use their wallpaper in conjunction with their icons, so the center might not be the best option. Experiment and see what works for you! I have a slight OCD condition which forced me to spend an hour or two measuring the centering of my icons down to the millimeter, but now I get all the chicks coming up to me wondering how my desktop looks so sleak. My results are not normal for all users, your experience may vary. Thanks for the info, good post. I knew about this since I got Windows7. Thanks anyways you reminded me to do it again.